In December Dave, my parents and I went for a long drive through the Klein Karoo and we passed the Stormsvlei farm stall – it is set less than 1km off the N2 but not once in our many trips along the Garden Route have we seen it. We decided that the next time we went away we would stop and see what the farm stall has to offer. Sadly, the farm stall is nothing special but as we had stopped, we decided to have some coffee. This was further influenced by the fact that they offered a Devonshire Tea. Dave and I had experienced this lovely treat in both Devon and Cornwall and we could not resist the offer of clotted cream. Unfortunately for me, the scones had sultana’s in them and as I don’t eat them, I picked them out of the scones – the poor chef must have wondered what was wrong with me! 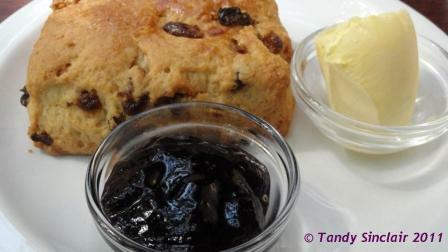 The jam was delicious and I had the teeniest, tiniest taste with the scone and clotted cream. I really wish I could get the clotted cream delivered to me like they do in the UK. The restaurant is set in an old hotel and has a lovely dining room, offers out door eating and has a lounge to relax in. The only downside is that you enter through the bar. The hotel is old and reminds me of the council recreation centers where I spent a lot of time in my youth. I can highly recommend that you stop for coffee along your way to or from the Garden Route.